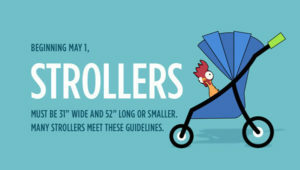 Also beginning May 1, there is a new size policy for strollers in the theme parks. Starting that day stroller can be no larger than 31″ (79cm) wide and 52″ (132cm) long. Also, stroller wagons will no longer be permitted as of May 1 (wagons are already not permitted). Starting today – March 28 – guests who bring coolers into the parks can no longer bring loose ice or dry ice in the coolers. Only reusable ice packs are permitted. Additional details on these new policies can be found at DisneyWorld.com/RulesFAQ and Disneyland.com/RulesFAQ.